Recently, I had someone ask me about how to go about building tiny when they work full time and are a single mom of two. Now I may not be the best to ask, as I am not single, not a parent, and not a mom, but I will do my best! First, I always feel that where there is a will, there is a way. I work full time, and often feel that I do not have the mental energy to work on this tiny house business when I get home, but then I go and check the various tiny house blogs and facebook pages I follow, check the number of views on this website (people actually look at it!) and get inspired. Some days I will work on the website design, others on the first plan, others on the business side. A mom will have it worse as they will get home and have to deal with cooking dinner for themselves and their children, making sure the kids get their homework done, get them bathed and off to bed, and THEN maybe have time to do something. But a family takes up space, and in a tiny house space it at a premium. However, I know it can be done, because I have seen it done. By my mom. 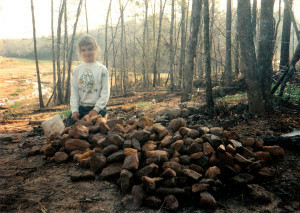 About 15 years ago, she bought some land out in rural Alabama. Directions to the place include turn off of the highway onto a local paved road, then turn onto the dirt road. It was far enough out of the way that it was cheap. That first year, she bought an old Dodge based boxy, 70’s era RV and she and my two sisters lived in that RV while they built the first room of their eventual house. I was off in the Army at the time, so was not around to help. 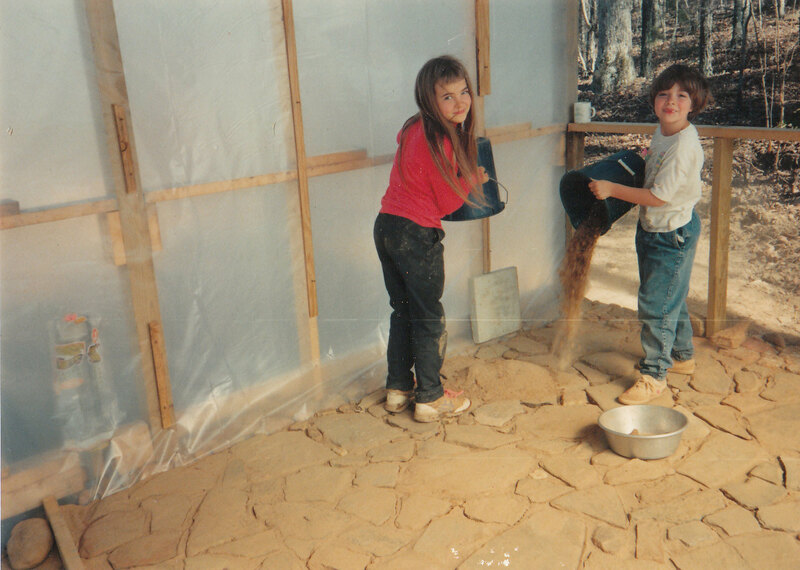 My sisters were too young to help with the major construction, but they still helped by going down to the creek and hauling up rocks that were used to build the wall behind the wood stove. 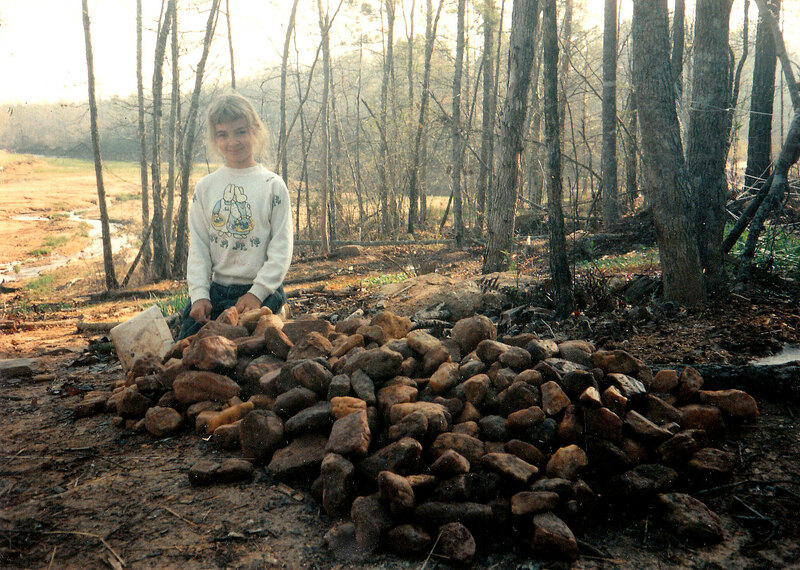 My sister was proud of her rock pile, all of which were carried up from the creek bed. Look at the size of some of them compared to her! My mom read everything she could, along with convincing those with skills to come and teach her. That first room was 12 ft x 16 ft, with a wood stove and a stone floor that was set in the sand that the girls carried up from a sandbar in the creek, but it was home. They slept in bunk beds, (I did help build those) mom on the bottom, and the two girls up top sleeping head to toe. Over the years, as the girls grew (and outgrew their allotted space) they built on more rooms, expanding outward and upward, but all on a shoestring budget. 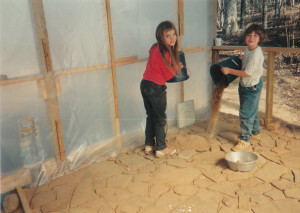 My sisters carried sand up from a sandbar in the creek which was used to bed the stone floor. However, first there are a few questions that need to be answered that are common to any good project. What do you truly need to live comfortably? What amenities do you need, and what can you do without? In the hot and humid climate of the south, for many people air conditioning is a must have in summer. People have (and still do) live without it, but life is much nicer with it. How about toilet and bathing facilities? Can you live with just having a shower, or do you need a tub? Can you live with a composting toilet, or do you need a normal toilet? How many beds do you need? how much storage space do you need? What appliances do you need for the kitchen? Do you need a full size refrigerator or can you get by with an under counter version, or even just a cooler? Are you sure that you can simplify your life? Can you get rid of stuff that is not essential to fit everything into a tiny house? Trust me, making things simple is complicated! These are just a few of the decisions that need to be worked out so you know how large you need to build. Are you a handy person with tools? Or do you know some who is that is willing to help / teach you? Is there a local community college where you can take a basic carpentry class? How about plumbing? Electrical? (I highly recommend using a professional electrician if you have any doubt, as electricity is NOT to be trifled with!) Do you have a place to build? The amount of knowledge (or willingness to learn) is a major factor. If you aren’t sure about the major construction aspects, many tiny house builders will sell you a shell house, with only the framing and sheathing assembled for a lot less than a fully assembled one will cost. You will have to put on the siding and the roofing, put in the windows and doors, and all of the interiors. Or you can negotiate with them and get a dried in shell, with roof, siding, windows and doors, but nothing on the interior. What is your budget? How much time do you have? What sort of quality do you want? Like most things in life, you can have cheap, you can have fast, you can have high quality, but you can only choose two of the three. If you want well built and fast, it will be expensive. If you don’t have any money, you can buy cheap and fast and wonder when everything is going to fall apart. Or you can go slow, and pay as funds become available and still get something well built. Buying fully built from a tiny house builder is the fast and well built option. Ultimately, the decision typically comes down to what you can afford to pay to have done for you. Once you have it, where will you put it? Once you have your tiny house built, if it is on wheels you need to figure out where you will be able to live in it. 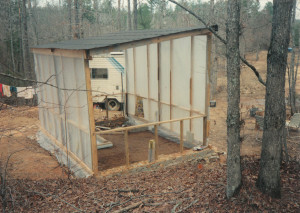 If you want a site built tiny house, you need the land. Be careful of where you buy or set up your tiny house, as most cities and towns have zoning regulations that make it difficult to just set up anywhere. 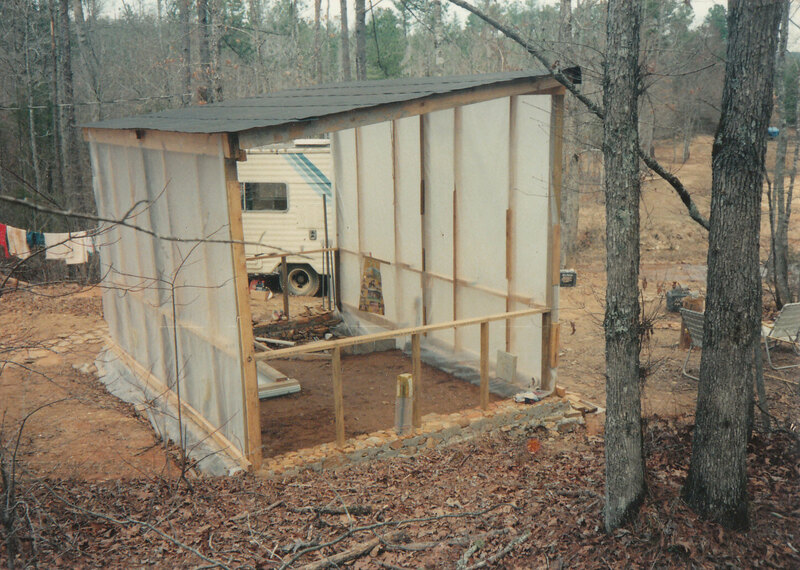 Some have zoning regs that forbid living in a trailer/RV (which is what they default to in categorizing tiny houses on wheels) even in a trailer park or campground. Great post! You need to add some kind of picture so I can pin it to my Pinterest. Do you have a picture of the house your mom built? Yay, thank you! I am off to pin it!